The connection between sheep and humans has a long history. 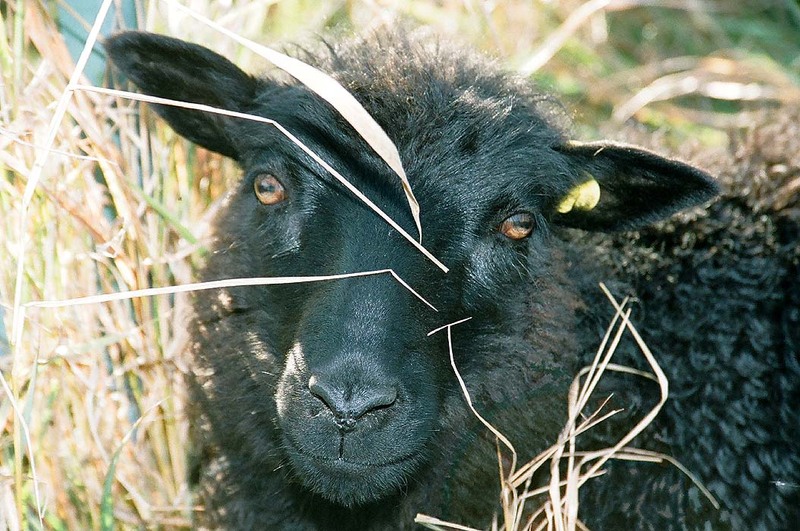 Sheep will remember, by their facial features alone, approximately 50 individual flock mates. Even if they have not seen that individual for over 2 years they still remember. Some studies have shown that sheep remember flock mates after over 5 years of separation. They can remember at least 10 human faces as well. This illustrates how important shepherds are to their charges. In the early days of civilization, communities maintained a community fold. Where all of the sheep of the community were housed for the night. When a shepherd collected their sheep in the morning, the sheep could identify their shepherd, and would follow him or her out to the hills for grazing. In the evening, they would follow the shepherd back to the fold. Even today, sheep easily identify their shepherd with food, protection, and assistance. We continue the partnership. Our responsibility to the sheep is to provide good pasture, fresh water, care, security, and shelter. 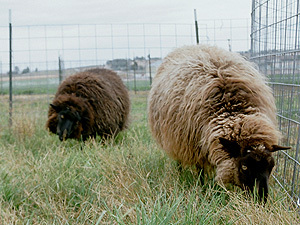 The pasture is the primary food of our sheep. We practice rotational grazing. The sheep take the grass from 12 inches deep down to as little as 2 inches and then they get more pasture. We have divided our pasture into 28 ft strips, and twice a day we move the fences about 8" per head. The sheep eat their way through a full pasture cycle in about about 6 weeks. Our pastures have a mixture of perennial grasses: orchard grass, blue grass, and fescue. We also overseed with some winter wheat in the fall. 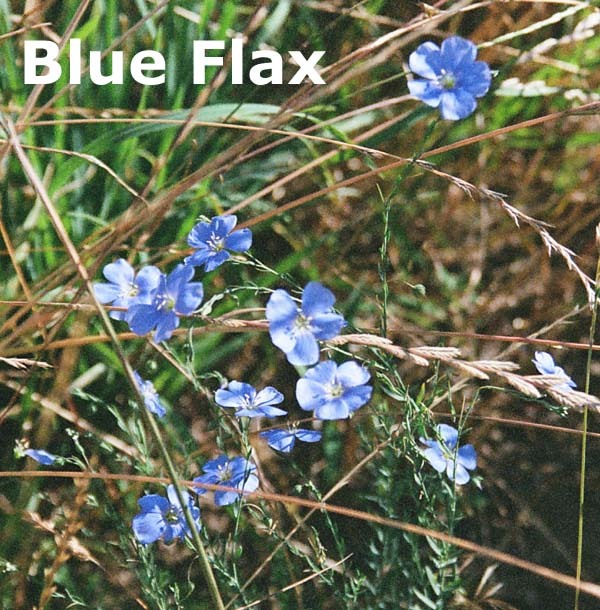 The pastures are additionally stocked with flowers and herbs. There is white clover, alfalfa, sainfoin, chicory, Florentine fennel, blanket flower, blue flax, purple coneflowers, mexican hat, evening primrose, melilot, dandelions, calendula, garlic, egyptian onions, and sweet violet just to name a few. Some of these you may recognize as medicinal herbs. Other medicinal plants that we regularly feed our sheep are rose, willow, and squash. 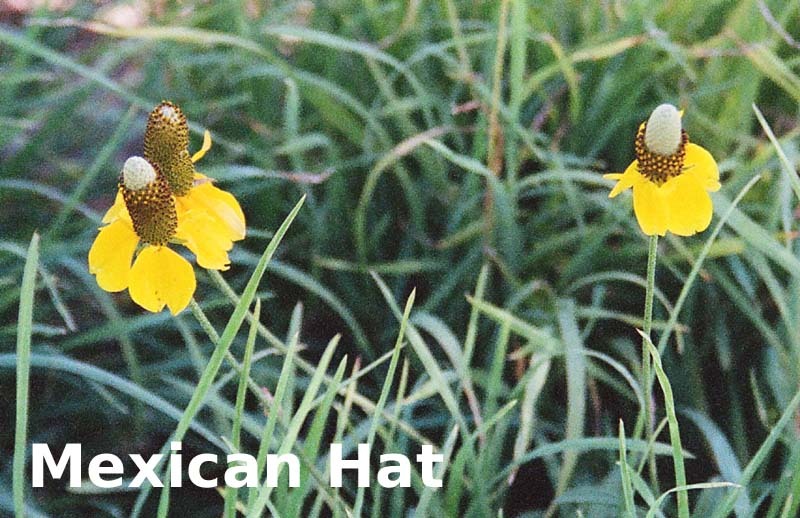 One of the funny things about the mexican hat is that our goats will not eat it. The sheep will mow it to the ground. I tasted it, and I agree with the goats. It is about the most unpalatable thing I have ever tasted. Very bitter, and the taste stays with you for a long time. We hand pick weeds on our pastures. This is very labor intensive. When establishing a pasture we have spent an average of 4 man hours a day for as much as six weeks, pulling weeds. After the weeds are pretty much gone we just do a walk through every couple of days, just to maintain a good pasture. Three of our biggest troubles have been, sand burr, goat head, and horse weed. Sand burr + sheep makes natures Velcro®. 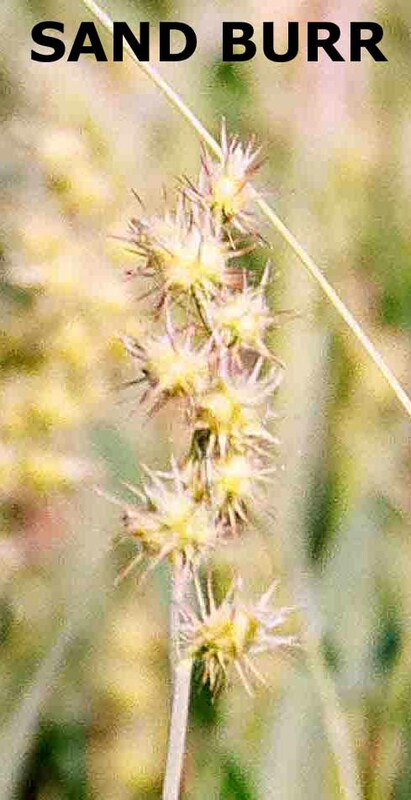 Sand burr is a very palatable grass, and increases with grazing. If given the opportunity they will blow in the wind. In the the early spring, about four weeks before spring shearing. We start the transition to fresh green feed. We set up moveable pens in the not so wild areas of our property. The sheep stay out for about 2-3 hours each evening. This gets them used to moving, and wearing halters again. Our first year we just used halters and a long tether. One evening I was pruning trees while the sheep were out. When I went round to check on the sheep, one of the ewes had wrapped her tether around a willow tree about 10 times. She was on her side, nose tight against the tree, mad as all hell, struggling to get loose. I actually had to slide her around the tree once to get her back on her feet. The well around the tree had collected a lot of sandburr from the previous season. She had found all of them. I must have spent an hour or more soothing her with gentle talk, and teasing sandburr out of her fleece. What a pain. Really, I mean those little burrs hurt the fingers. Two minor problem weeds have are, red rooted pig weed, and lambs quarter. Some of the sheep find both very palatable. We remove all red rooted pigweed, it is high in oxalates, and is also a nitrate accumulator. Our sheep who prefer red rooted pigweed, develop a good case of the scours, a symptom of oxalate poisoning. Lambs quarter can be an ok forage, and a good vegetable for people as well. Lambs quarter has the advantage of pulling minerals from deep in the soil, much like dandelions do. However, it likes very rich soil, and if it is growing in heavy manure it can be a nitrate accumulator as well. So we tolerate a small amount in the pasture, but we are careful to not let it get too plentiful. The secondary feed from June through the November is fruit. We have apple, apricot, pear, nectarine, peach, and plum trees, and the sheep enjoy a lot of the windfall and unwanted fruit. We do not use chemical pesticides on our pastures or fruit, so the sheep can enjoy it all. A particular treat for all of the animals is the white cloud crab apples. They are about 1/2-3/4 inch in diameter and have a wonderful sweet tart flavor. We use them as reward treats. They have learned that I often keep one pocket full of these crab apples. I can be working with one ewe, trimming hooves or such, and the smarty alecky leader sheep will sneak up behind me, and start removing things from my back pockets looking for crab apples. When I first started raising animals, I told a ranching friend that I was learning that I was really as much a grass farmer, as a livestock breeder. She told me that to create a successful pasture, I was really growing soil, and needed to focus on the care of the land. Our pastures were originally scrub. The soil was a fine silty sand. With water it will grow just about anything. The problem is that it does not hold water very well. We started the pastures with some grass seed, and a couple of goats, and sprinklers. The goats have done a good job cleaning up the weeds. We have added organic matter in the way of leaves, saw dust, all compostable kitchen and garden waste, and cut and lie mowing. The goats and sheep added their own fertilizer to the mix. Our soil is not perfect, but it is better every year. One of our concerns is the contamination of ground water. We are very careful not to over water the pastures. One wants to give the grass enough water to encourage the roots to grow deep, but not deep enough to push the nutrients beyond the roots. When farmers leave the water on their crops for long periods, they are pushing the fertilizers, and chemicals below the reach of their crops. This is not good for the farmers costs, and it is not good for the environment. In the valley we live in, the water table rises in the summer when the crops are being irrigated, and drops in the winter after irrigation ends. Many wells as deep as 100 ft. have nitrate contamination, This is caused by fertilizers, and animal wastes soaking into the soil, and down into the water table. We are not an organic farm. However, we believe that good quality food, and clean water are important for a healthy and long life. We apply this to our animals as well. We have rarely needed to treat our sheep or goats for internal parasites. We use rotational grazing, feed them raw garlic, squash, and chrysanthemums. 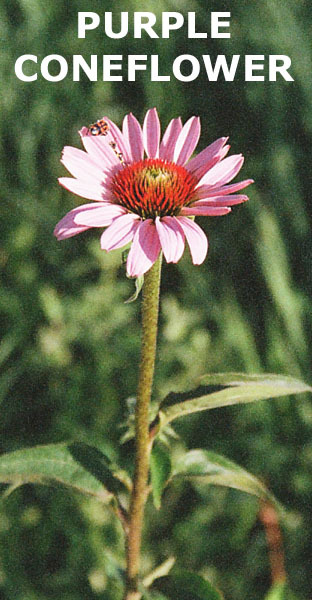 We grow medicinal annuals around the pasture, and perennials in the pasture. For repelling insects, we use a herbal mix containing citronella, cedar, and eucalyptus. Normally, other than an annual tetanus shot, and bag balm? for cuts or the occasional abscess, our sheep do not receive anything unnatural. The one time we had to deal with fly strike, we used a more aggressive regimen. We used pyrethrin to kill the maggots, once again bag balm® to protect the healing skin, and penicillin for the subsequent infection. We have coyotes in our area. We occasionally see a pair hunting gophers, and mice in the local alfalfa fields. Our fences are sturdy, and not easily dug under. Our gates are easier to dig under, but we have never had a problem with them. We discourage the coyotes from our pastures, they will occasional come within 200 ft of the house. We spread dog waste in critical areas about 50 ft. from the pastures, and encourage our dogs to mark territory all around the property lines. The couple of times that coyotes have ventured in to the pasture area, we have scared them away. We keep a few bottle rockets, and a launch tube by the back door. This has worked well over the years, and is kind of fun too. However, most of the time, they just wake us up with their howling at 2 o'clock in the morning. Normally, I do not go out and check on the animals when the coyotes are active. Typically the sheep are laying down quietly out in the pasture. They seem to have the good sense to not draw attention to themselves. I know that if I go out there they will start moving around, and making noise, and I mean lots of noise. Predators can be a touchy subject for people raising sheep, but probably the most dangerous predator is the neighbor's dogs. What makes dogs really dangerous, is that unlike coyotes they are not afraid of people. Unless a local dog is proven to be trustworthy, we do not allow them to hang around. The bottle rockets work well on dogs too. My personal opinion is that paint balls are a better solution. It would be a good warning to the owner to keep better track of their dogs. Even though statistically coyotes are the major predator of sheep. Five times more than dogs. I only know one breeder who has lost animals to coyotes. However, I do know several who have lost animals to dogs. We do not breed our first year lambs. In our minds, it is too stressful for the still developing ewes. It is the equivalent of a 13 year old girl having a child. Most could, but it is not the healthiest thing, for the mother or the child. A ewe is still growing in her second year. It is a lot of physical stress to feed a lamb (it is common for first year ewes to have a single lamb), and feed their own growth. It is best to let them grow strong, and healthy before breeding. This is a good foundation for the 10 or more years of lamb production they have ahead of them. It may be anthropomorphizing, but we feel that our animals have needs, desires, and pleasures, similar to us humans. They do not exist exclusively for what they provide us. They should have as satisfying a life as possible. We are involved in a partnership, and as mentioned before it has a long history. Providing our animals the best life we can is our responsibility. We think our methods make for healthier, and happier sheep.